For years, many policymakers, industry representatives, and commentators were opposed to a comprehensive federal privacy law. They typical federalism arguments were often trotted out. 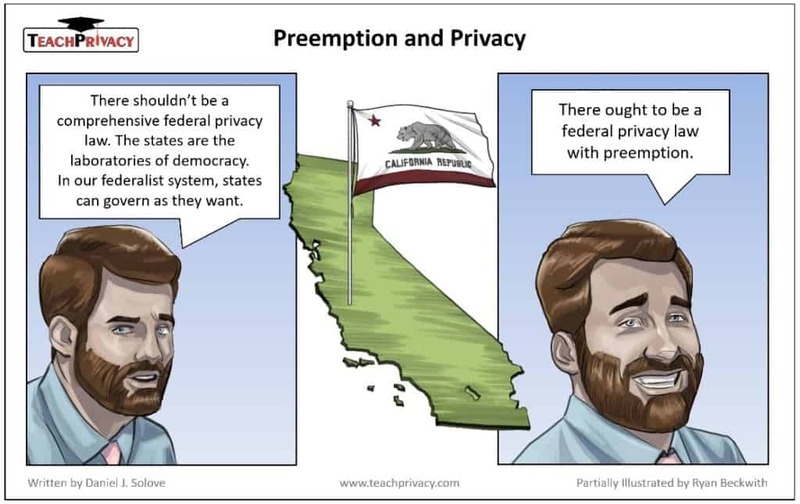 Then, in 2018, California passed the California Consumer Privacy Act (CCPA). Now, there seems to be a chorus for a comprehensive federal privacy law with preemption. I’ll be posting soon about my thoughts on a federal law and on preemption. Professor Solove is the organizer, along with Paul Schwartz, of the Privacy + Security Forum (Oct. 14-16, 2019 in Washington, DC), an annual event designed for seasoned professionals. The CCPA summarized in just 1 page! Click here to download the full-page version.